To me, a good book is akin to a good holiday or time spent away from home: a place where your new surroundings become your temporary reality; it’s a time where you meet new people, friends or otherwise, and embark on a journey so escapist from your mundane routines that any semblance of your normal life is a foggy memory in those moments. Neil Gaiman’s Hugo, Nebula, Bram Stoker and Locus Awards winning American Gods is such a tale: a fantasy grounded in a reality we all know in some way or another; it takes us on a dangerous journey through the heartland of modern America, a place where both ancient and modern Gods live and breathe, and danger, excitement, revelation and imagination lurk at every turn. 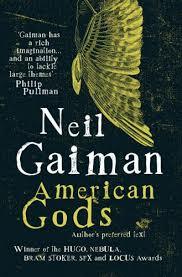 One doesn’t have to be American to understand American Gods; Gaiman’s looking glass is so expertly manifested on the pages that it immerses you in the world he takes us too. However, despite being a commentary on middle America, many of the themes in his tale are universal; not to mention it’s also good old fashioned storytelling at it’s most grandiose and genius. The story follows a man named Shadow; having just been released from prison to find out his wife is dead, he accepts a job from a mysterious man he meets on a flight called Mr. Wednesday, who knows all about Shadow. He claims to be the ”king of America” and a survivor from an Old War. It turns out he’s Odin, a God from Norwegian folklore. He informs Shadow that a war is imminent between the gods of old and new. With nothing to go home to, Shadow takes up Wednesday’s offer and they embark on a journey across America, meeting odd characters and avoiding the dangers that pursue them. For a novel so huge in scope, ideas, concept and ambition, American Gods manages to come across as natural and has us believing every single word. Furthermore, it’s as smooth as silk to read despite clocking in at over 600 pages. Gaiman’s inventive pros are absolutely mesmerizing, and his story is more addictive than heroin or True Detective season one. I haven’t tried heroin, nor do I intend to: but from what I understand it’s addictive. The old Gods are representative of many different cultures and symbolic of modern immigration. They live in squalor and poverty, waiting for America to notice them to regain past prominence. Here, Gaiman is making a statement that immigrants are forgotten and left behind by the American Dream. American Gods also has messages about the advancement of technology, the rise of the internet and the role of media. Moreover, it deals with themes such as love, loss, heartbreak and self-discovery and small town life. It’s symbolic, haunting, funny and steeped in imagination; hyperbole it is not when I call it the most enriched reading experience I have ever had the joy of experiencing. It made me laugh, it left me cold, it gave me closure then left me aching for more. When it was all over, I felt lost and sad that my journey had ended.